In the late 20th century, a British prime minister looked at her country, saw that it was in decline and set out to reverse that decline; her name was Margaret Thatcher. In the mid-fourth century a Roman emperor looked at the Roman Empire and saw that it was in decline and set out to reverse that decline: his name was Julian the Apostate. 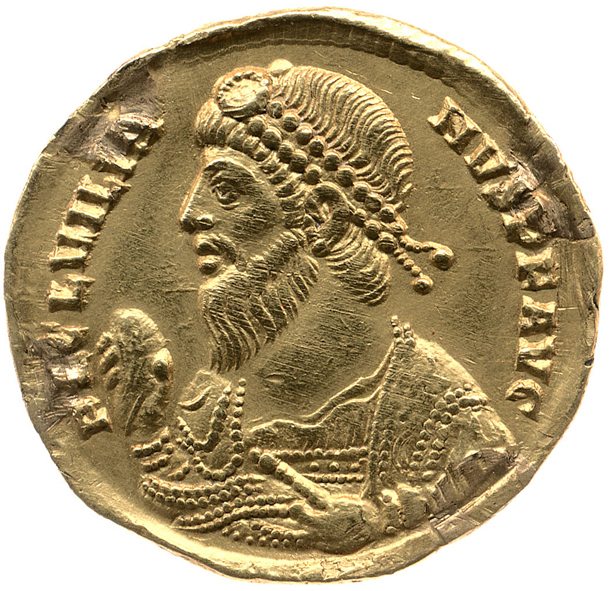 Coin of Julian the Apostate, wearing a beard. The die-cutter did not quite know how to depict a beard, so it is rather pasted on. Julian is best known as the emperor who set out to roll back Christianity, and is thus known as the ‘Apostate’. However he is far more interesting than this: he saw that Rome was in decline and he set out to reverse the decline on all fronts. If therefore we wish to analyse the decline and fall of the Roman Empire we need to look very carefully at what this very intelligent, even if occasionally slightly batty emperor set out to do. He did not actually achieve very much for sadly he was killed fighting the Persians after only eighteen months as supreme Emperor. Nevertheless what he achieved in these eighteen months makes him the only noteworthy emperor in the fourth century after Constantine. Before he became full Emperor, he spent six years as Junior Emperor (‘Caesar’) in Gaul and it is here that he carried out his best-known cost cutting exercises. Julian was a very distant relative of Constantine and thus at the age of twenty four he was summoned to be Caesar of the North West Empire, but given very little power. Nevertheless he became an extremely skilful soldier and won a major battle at Strasbourg against the invading Germans. He then went on to re-organise the finances and in teeth of opposition from the civil service, he reduced the annual poll tax from 25 gold coins to just 7 — according to his friend the historian Ammianus Marcellinus who was actually with him in Gaul: Margaret Thatcher would have approved. When he became full emperor, he began by cutting down the Civil Service. There is a famous story of how he called for a barber and a gentleman appeared in gorgeous clothes: ‘But it is a barber that I require’ said Julian,’ not the Chancellor of the Exchequer’. He asked how much he earned, and was told that in addition to his salary, he had the allowance for 20 men and their horses and many profitable perquisites. He dismissed him and began a purge of the palace staff: there were a thousand barbers, a thousand cupbearers, said the orator Libanius, while the eunuchs could be compared only with the insects of a summer’s day: one began to understand where all the money went in the late Roman Empire. Julian also tried to revive the cities. The Roman Empire, like the Greek civilisation before it, was based on cities. The cities were in turn based around their councils known as the ‘curia’, and in the great days of the empire the leading citizens all vied to be members of the curia and to embellish their city with fine architecture and working sewers. By the fourth century membership of the curia had become a great burden and something to be avoided. One of the privileges given to the Christians by Constantine was that priests could opt out of the curia. Julian tried to reverse all this. The income of the city was increased: land that had been taken over by the Emperor was given back to the cities — together with the rents it produced. At the same time the burdens on the curia were reduced. And finally there is the attack on Christianity. Julian did not of course actually attack Christianity — he simply passed an Edict of Toleration. Christianity at the time was bitterly divided between the Arians and the Catholics, and many Arian bishops had been driven into exile. Julian proclaimed that not only should Pagans be tolerated, but also the Arians, and he hoped that once the Arians were brought back and ‘tolerated’, the Christians would tear themselves to pieces. What is the equivalent of Christianity today? 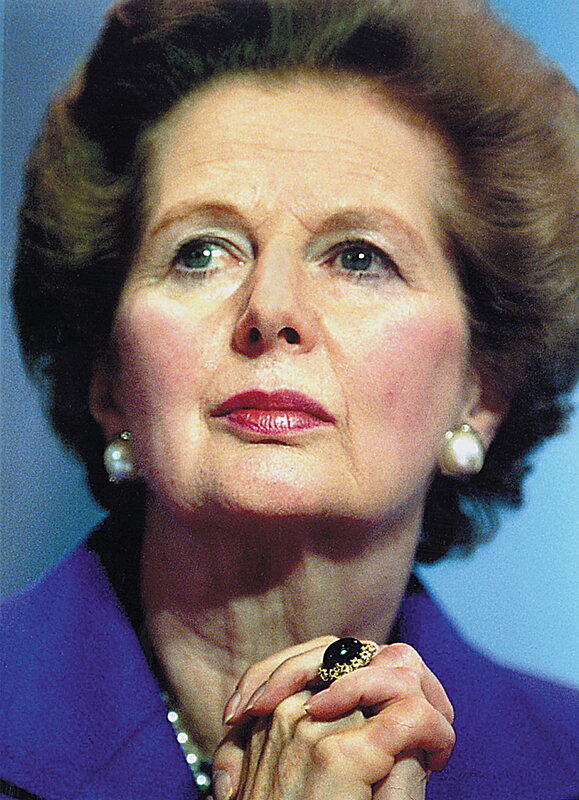 For Margaret Thatcher the answer was surely socialism, a weed that was slowly strangling western civilisation. Perhaps the analogy is inexact because socialism was already in decline, and Marxism, its intellectual backbone was already bankrupted by the failure of communist Russia. I suspect that the real analogy should be with the Greens, who like the Christians have a lot of worthy ideas which they then push to extremes. Unlike Margaret Thatcher who managed to survive eleven years before being knifed by her own party, Julian spent only six months at Constantinople before moving east to fight the Persians. On the way he spent six months in Antioch, the leading city of what is today Syria, but then a fun-loving Christian city. Julian grew a beard to emphasise that he was a philosopher and therefore intellectually superior to the Christians, and refused to go to the circus or partake in the many pleasures that gay, fun-loving Antioch had to offer. He then tried to excuse himself by writing a pamphlet entitled The Beard Hater in which he tried to explain away his wearing of a beard and dislike of the circus. But all too soon he left to fight the Persian Empire, then at its height under its great King Shapur. He reached their capital Ctesiphon and prowled around it, but was then stabbed in the shoulder and died. With his death the expedition collapsed, and an ignominious peace was concluded by which the Romans withdrew from Mesopotamia: the Persians had won, but the boundaries that were drawn remained intact until the Muslim invasions. So in a way the ignominious peace was a great success as it solved the Persian problem. Like Margaret Thatcher, Julian remains a controversial figure. However unlike Margaret Thatcher, many of whose reforms have remained intact, Julian’s reforms failed. His successor restored Christianity, and within fifty years Theodosius made paganism a crime. But like Margaret Thatcher, Julian remains a divisive figure: he has recently been the subject of a hostile biography by my former tutor, Glen Bowersock, as well as a friendly biography by Robert Browning. He is certainly the most interesting figure of fourth century Rome and we should study his reforms closely if we want to see what the most brilliant thinker of the fourth century thought what was wrong with the Roman Empire. For a fuller account of Julian, click here. Well, how to insult my favourite Emperor… And rather revealing of the author’s politics. It’s still Christianity and its spin-offs: the authoritarian Middle-Eastern monotheist religions. Julian still represents hope — a better future that might have been. Imagine a world without the long history of Christian anti-Semitism (he was planning to rebuild the Jerusalem Temple, and gave the contract to Alypius, former Sub-Prefect of Britannia); with Christianity put back in the box as just another oddball Eastern cult; and the parts of the Middle East beyond the Empire remaining Zoroastrian. Thatcher destroyed hope for whole communities, and, for some of us, the hope of any kind of economically and professionally secure life. I also can’t help but think she’d have been personally horrified by this loveable, witty Greek geek, who teased the Antiochenes about being a hairy hippie (“And I’ll tell you a secret,” he writes in the Misopogon, as if the beard wasn’t bad enough, “I’ve a hairy chest like a lion’s, too!”), and once dealt with a military unit that performed badly in the field, not by decimating them (the traditional punishment of killing one in ten after drawing lots), but by making them parade through the camp in drag, before disbanding them. I’m also tad perplexed that the article this links to deplores his animal sacrifices. Although a vegetarian himself, Julian understood that, besides being an impressive ritual, bull sacrifices gave the troops and poor civilians a boost to their rations. People tend to be happier when they are not hungry: something Thatcher and her disciples never cared about. And for up-to-date reading material, I recommend my old friend Shaun Tougher’s books on him, and Rowland Smith’s Julian’s Gods. (Bowersock seems to write as if Julian had done something to him personally: I really don’t understant his animus against him!) There is also a touching tribute in John Gaskin’s Traveller’s Guide to Classical Philosophy. Best of all, his own works are available in the bilingual Loeb Classics edition (3 vols). Theodoretos was wrong to invent Julian’s ‘last words’ as: “You’ve won, Galilaean!” Because through preserving his works to try to refute them (even the odious Cyril of Alexandria played his part in that! ), the Galilaeans left a time-bomb for freer times. We can choose to live as if they didn’t win, and so deny them power over us. Also — and apologies for formatting problems in last post — he was wounded between the ribs, in the liver, not the shoulder (see Ammianus Marcellinus and Libanios). The tragedy is that, these days, he might have been saveable.